Three years ago, I shared that BTL Architects would be part of a project to restore the Congress Theater in Logan Square. Last week the Chicago Plan Commission gave the project the green light. The $69 million renovation project includes a seven-story, 72-unit residential building that the developer said was essential to the success of the overall project. The Congress Theater, built in 1926, is noted for hosting musical acts such as Chuck Berry and Jerry Lee Lewis and was recently named to the National Register of Historic Places. In a Chicago Tribune story that featured several photos of the building as it exists today, it was noted that the project’s delay was partly caused by the death of one of the developer’s partners. Watch this site for progress on the project and a revised opening date. 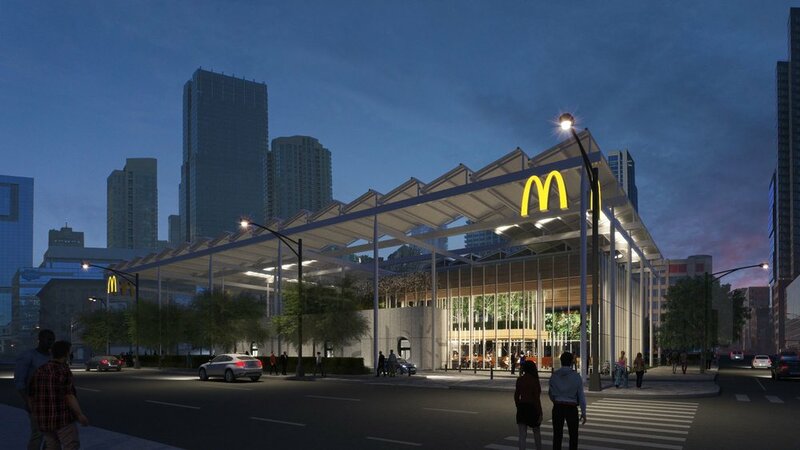 Earlier this year, Chicago's iconic Rock 'N' Roll McDonald's, complete with its signature oversized golden arches, was demolished in preparation for construction of a sleek, eco-friendly “store of the future.” Since it first opened as a tourist attraction in 1983, the site has been one of the most famous McDonald's locations in the world and was once the busiest in the United States. The original building was torn down and replaced in 2005; and the newly updated restaurant will abandon the rock ‘n’ roll theme, reuse the old building's kitchen and deploy design elements (such as solar panels) to improve energy efficiency. Curbed Chicago reports that "the theme of sustainability continues with living fern walls, a cross laminated timber structural system, and a mini-orchard of harvestable apple trees visible though a clerestory window." McDonald’s evolving design philosophy is said to be the company's latest measure to remain fresh and relevant. Elements of the new River North flagship will eventually be rolled out across the country. The Park Ridge, IL-based Masonry Advisory Council's latest newsletter featured one of BTLA's recent projects: the Benefits Department Building at Northwestern University. As I discuss on our portfolio page, this brick and stone structure was originally built in 1895 and required extensive work on the masonry as well as the original wood cornice. Berglund Construction served as both the Masonry Contractor and the General Contractor. The 12,000 square foot of exterior wall surface of the building had a wide range of brick colors, surface deterioration, changes to brick texture due to exposure, and brick sizes. Berglund used age old tuckpointing techniques to help bring this building back to life. The project took about 5 months to complete. Take a moment to read this detailed profile. Last December, I shared a blog post that gave a little background about the historic Congress Theater in Chicago's Logan Square and our involvement in efforts to bring the building back to life. Last week, Curbed Chicago editor AJ LaTrace ran an article that provided an update on this major renovation project. New sketches, submitted to the city last week, propose either 32 residences in the theater building or 50 hotel rooms. A separate 10-story residential building would be built on the vacant lot across the street and would include 120 units and ground floor commercial space. Alderman Joe Moreno's office has said that a community review of the proposal will begin shortly. In the meantime, the owners of the theater have sought landmark status for the 90-plus-year-old building. If secured, the building would be eligible for federal preservation tax credits. As our work proceeds, I will offer additional details on our Portfolio page.